Looking for ultra-slim smartphone to be your next handset? If so, the new Samsung Infuse 4G and Samsung Galaxy S II (S2) are worth considering as both of them features an ultra-thin body. Both of the contenders feature a next-generation Super AMOLED Plus display that renders beautiful graphics for video, photo and other graphics with its bright, rich color. 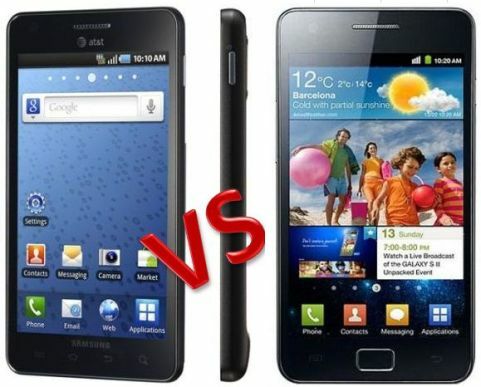 To make a better choice, check through the comparative table of Samsung Infuse 4G vs Samsung Galaxy S2 for features and specifications comparison in detailed. From the table above, you can easily found that the Galaxy S2 is noticeably slimmer, thinner as well as lighter, delivering a higher-performance dual-core processing power and Android 2.3 experience. However, the Infuse 4G packs a bigger 4.5″ screen display and stronger battery. In my opinion, your choice is based on your needs! Samsung Infuse 4G that supports HSDPA CAT 14 and HSUPA CAT 6 will hit AT&T stores on May 15 for $199.99 on a 2-year service agreement, while Samsung Galaxy S2 just hits FCC on the way to the United States – no words on launch date, price and mobile carrier yet.